Clients often report a sense of perspective and clarity after receiving a massage. The emotional balance massage therapy provides can often be just as vital and valuable as the more tangible physical benefits. At Caron Chiropractic, we realize that research shows the enormous benefits of touch, which ranges from treating chronic diseases, neurological disorders, and injuries, to alleviate the tensions of today’s lifestyles. As a result, the medical communities and insurance companies are embracing message therapy as part of an integrated part of your overall needs. Many hospitals are also incorporating massage practitioners to treat post surgery or pain patients as part of the recovery process. Getting a massage can do you a world of good. Taking part in this form of regularly scheduled self-care can play a huge part in your health. It is truly an investment in your overall well being. Remember; just because a message feels like a pampering treat doesn’t mean it is any less therapeutic. Consider massage therapy a necessary piece of your health and wellness plan. 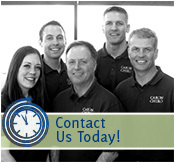 Caron Chiropractic practitioners will work with you to establish a treatment schedule that will best meet your needs. Our staff is dedicated to helping you live your life in optimal health without drugs or surgery! Every Body Deserves A Massage! Contact us today for an appointment. This entry was posted	on Monday, January 30th, 2012 at 6:00 am	and is filed under Chiropractic Treatments, Massage Therapy. You can follow any responses to this entry through the RSS 2.0 feed. You can leave a response, or trackback from your own site.